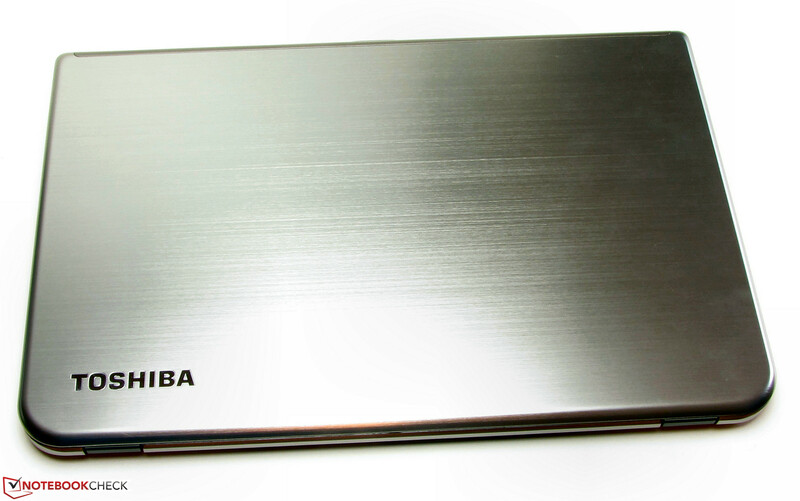 Ultrabook by Toshiba. Toshiba now has a new ultrabook series in its lineup and the manufacturer relies on cutting-edge technology for it: Haswell ULV processor, touchscreen and a swift SSD cache are to lure laptop buyers. Whether it can will be seen in our test report. 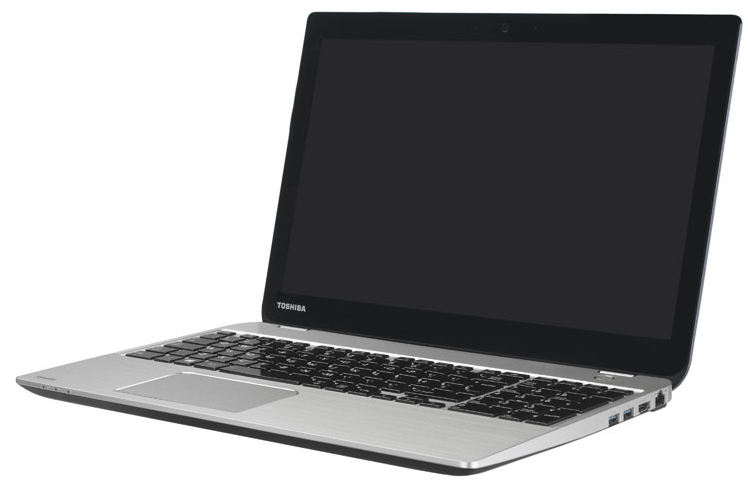 Toshiba introduces a brand new ultrabook line with the Satellite U50-A series. The tech specs look good: A Haswell processor, high storage capacity and a casing that is partly made of aluminum. Our test report will reveal whether the Satellite U50t-A-100 is just as compelling in everyday use. We used both the AsusPro P56CB-XO193G (Core i3-3217U, GeForce GT 740M) and Lenovo IdeaPad U430 Touch (Core i5-4200U, GeForce GT 730M) to classify the laptop. The latter is a 14-inch ultrabook. 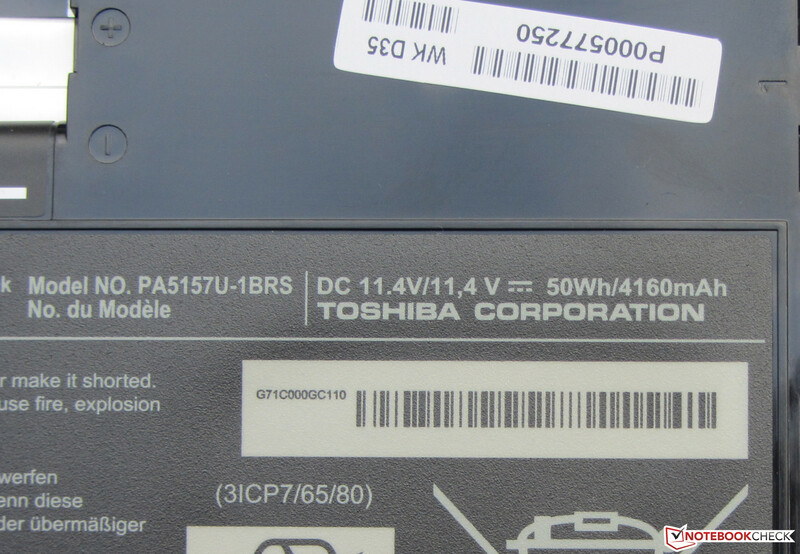 The Satellite's underlying casing form language corresponds to Toshiba's current design that we know from the Satellite S50-A and Satellite L50-A. Of course, the U50t-A is much thinner than its brand name brothers. 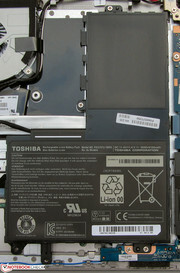 Toshiba uses a combination of materials. 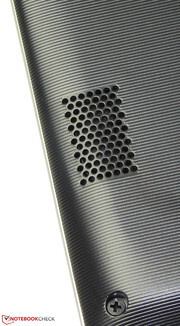 The display's back and the wrist rest are comprised of brushed metal whereas the other parts of the casing are plastic. 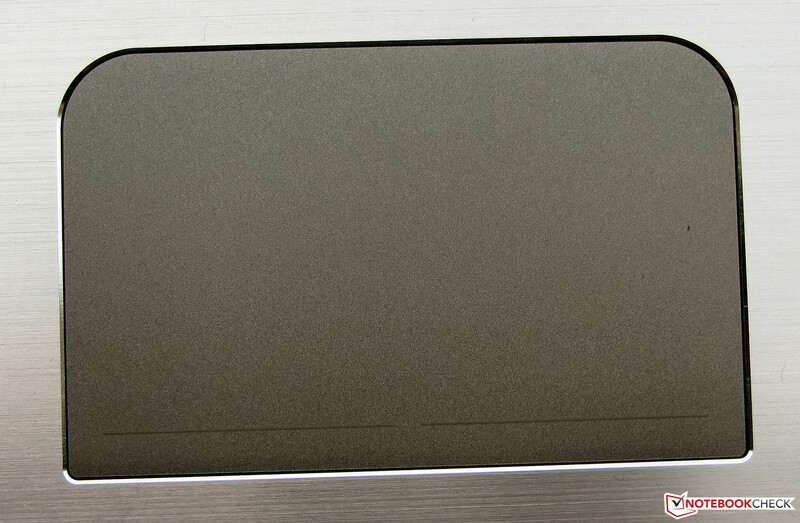 The base unit's upper side features the same silver-gray color as the wrist rest and display's back. The base unit's tray and display's frame are black. 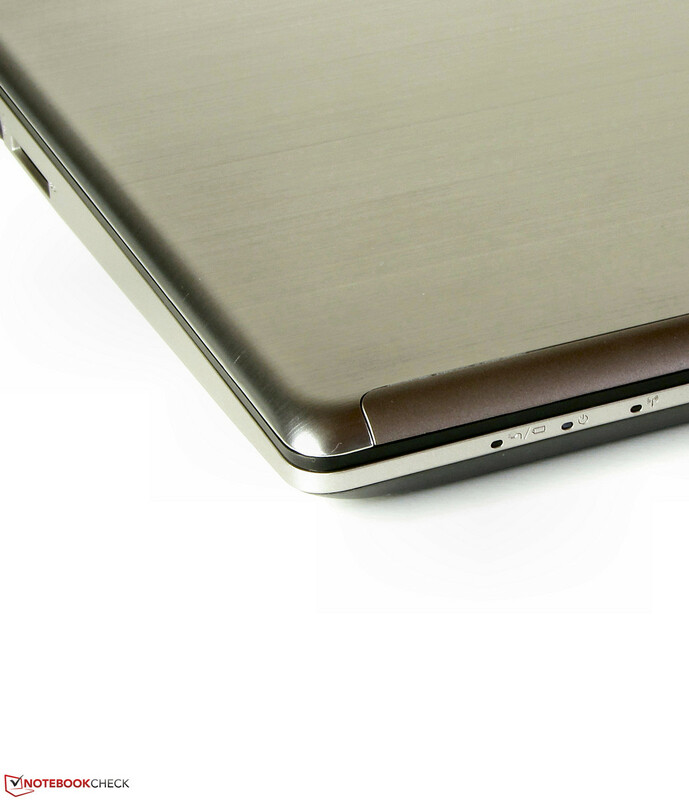 The manufacturers of the IdeaPad and P56CB also use a mix of metal and plastic. The base unit can be warped on both sides of the keyboard and below the touchpad to a slight extent. We see this behavior in many laptops. The base unit's stiffness is within acceptable limits. 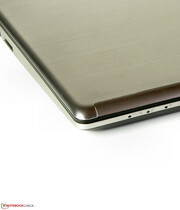 Owing to the laptop's aluminum back, the lid can only be twisted slightly. The back also proves to be quite resistant to pressure; it can only be dented to such an extent that image distortions occur in very few places. The hinges keep the lid firmly in position and only rock marginally. Opening the lid with one hand is possible. The connectivity of our three comparison devices correspond to the current standards. Only the Asus laptop sports a VGA out. Owners of the Satellite or IdeaPad will have to use an HDMI-to-VGA adapter (price approx. 20 Euros, ~$27). Also, the P56CB is the only laptop with an optical drive. All three computers have three USB ports. Only the Satellite comes with two USB 3.0 ports. The interface positioning is favorable. All ports are in the rear half of both sides. Consequently, the areas left and right of the wrist rest remain uncluttered from cables. 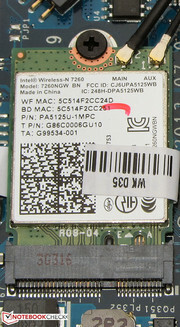 Toshiba installs a Wireless-N 7260 Wi-Fi module from Intel. It supports the Wi-Fi standards 802.11 b/g/n and also supplies Bluetooth 4.0. The reception did not give reason for complaint. The Wi-Fi display from Windows always exhibited the full signal in the router's direct vicinity (approx. 3 meters) as well as two stories above it in a non-standardized test. The routers transmitting capacity was roughly 50%. A Realtek Gigabit Ethernet chip from the RTL8168/8111 family takes care of cabled networking. 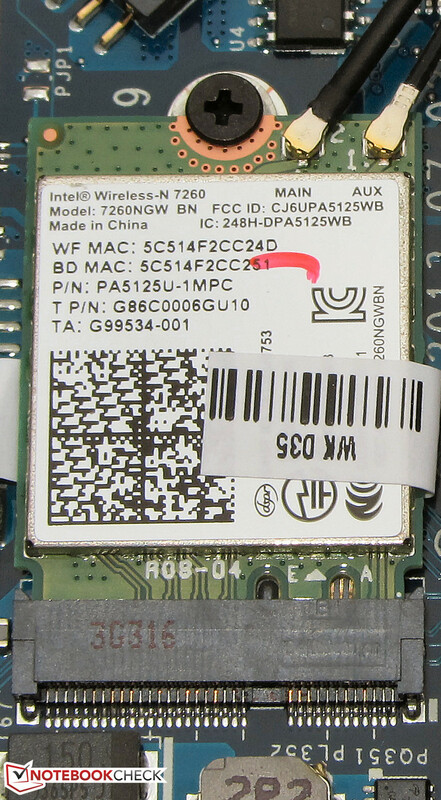 This chip is found in many laptops. The built-in, 0.9 megapixel webcam was not convincing. It shot blurry pictures in a resolution of up to 1280x720 pixels. There are no accessories included apart from a quick start poster and a manual (Instruction Manual for Safety and Comfort / Limited Warranty). The Satellite comes with Windows 8 (64-bit) preinstalled. A Windows DVD is not included. The buyer should therefore create a recovery medium via the preinstalled Toshiba Recovery Media Creator immediately after purchase. This enables reinstalling the system after, for example, exchanging the hard drive. DVDs (providing an external burner is available) or a USB flash drive with at least 16 GB of storage can be used for this purpose. The Satellite does not have a maintenance cover. 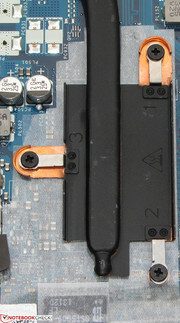 To access the innards, the base unit's underside has to be removed. This proved to be quite simple. The underside can be lifted off using a putty knife after removing all screws. It enables accessing the working memory, hard drive, SSD cache, Wi-Fi module, BIOS battery, battery and fan. The Satellite features two working memory banks whereas only one is furnished with a 4 GB module. 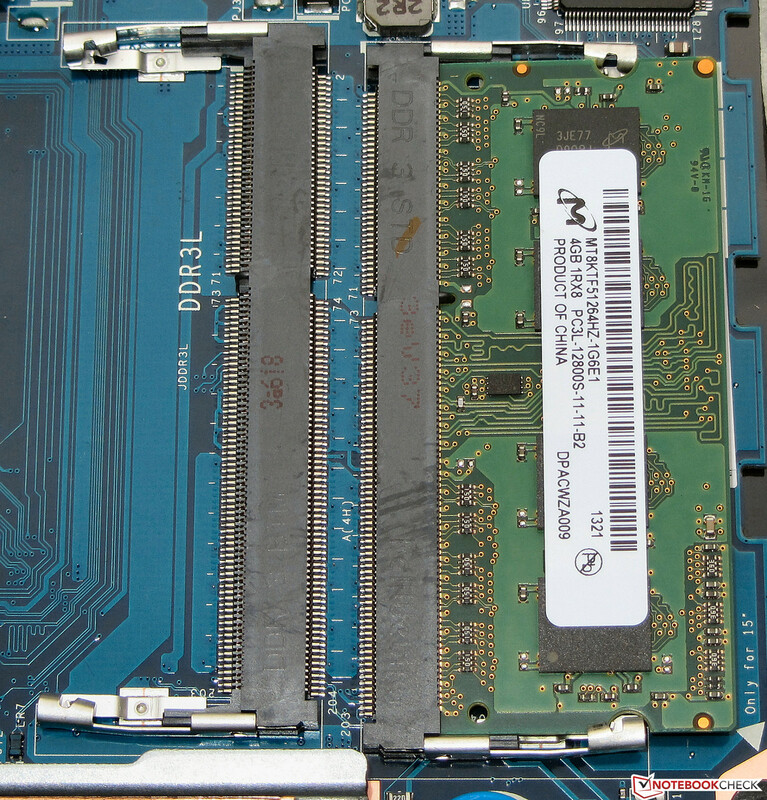 Users who want to upgrade the working memory must buy a DDR3L module. These modules can be operated with a lower voltage (1.35 V) than conventional DDR3 modules. We tested this with a conventional module and the Satellite refused to boot. 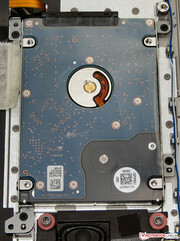 Replacing the hard drive is no problem; 2.5-inch hard drives with a height of both 7 and 9.5 mm can be used. 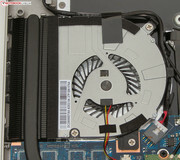 The fan can be taken out for cleaning and it would also be possible to replace the battery. The Satellite includes a 24 month warranty including pick-up service for some countries. Both the Asus laptop and the IdeaPad come with a two-year warranty. It is possible to upgrade the Satellite's warranty, for example to a three-year on-site warranty for around 80 Euros (~$109). Toshiba installs a backlit chiclet keyboard in the Satellite. 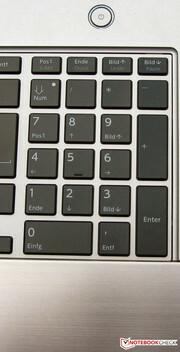 The main keys feature a size of approx. 15 x 15 mm. 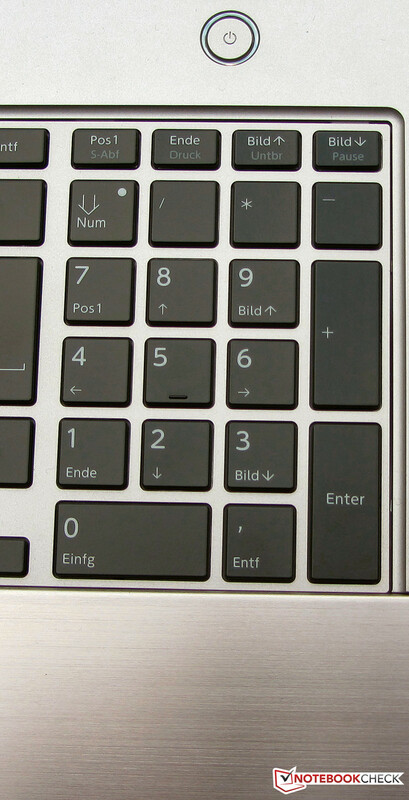 The even, sleek keys generally have a short drop and clear pressure point. The keys' resistance is also satisfactory. The keyboard yields marginally in the center when typing on it, but that does not affect working. 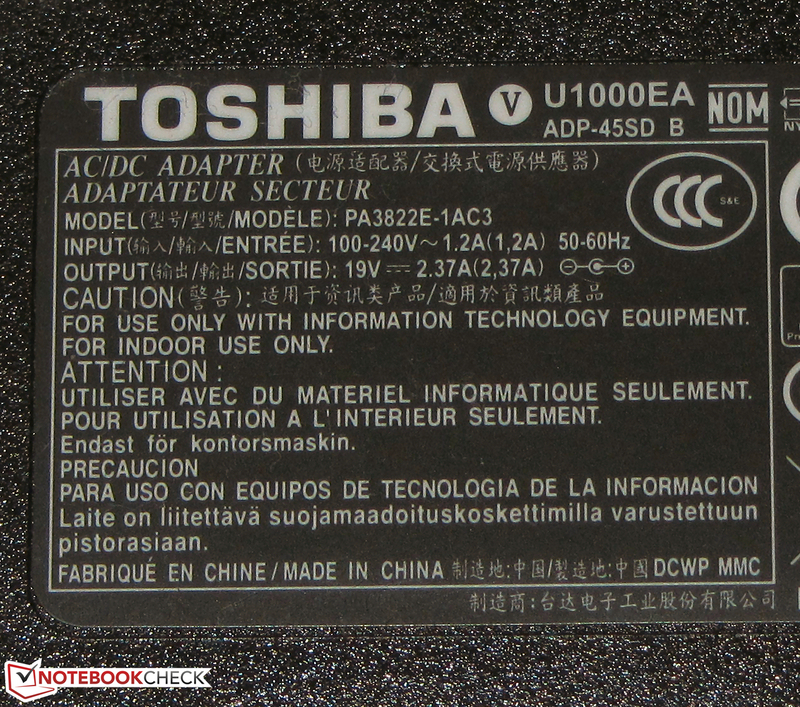 All in all, Toshiba supplies a laptop keyboard that is above average. Even prolific typists will be able to work with it. The mouse replacement features a generous size of 10.7 x 6.7 cm and is designed as a multi-touch capable ClickPad. The lightly roughened surface does not interfere with gliding. The large surface makes using multi-touch gestures a piece of cake. The single gestures can be turned on and off in the pad's settings menu. A ClickPad does not have dedicated mouse buttons; the entire pad is a key and it detects which mouse button is being triggered by where the finger is placed. The pad features a short drop and a clearly audible as well as palpable pressure point. Another input option of the Satellite is the touchscreen. 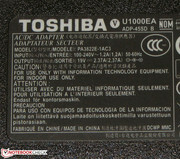 Toshiba uses a model with 10 touch points. The touchscreen functions precisely and does not cause problems. Inputs are implemented instantaneously. Nevertheless, it is doubtful just how much sense a touchpad makes in a conventional laptop. The author believes that it does not bring an advantage and only drives up the purchase price. The Satellite's glare-type 15.6-inch screen comes from Samsung. 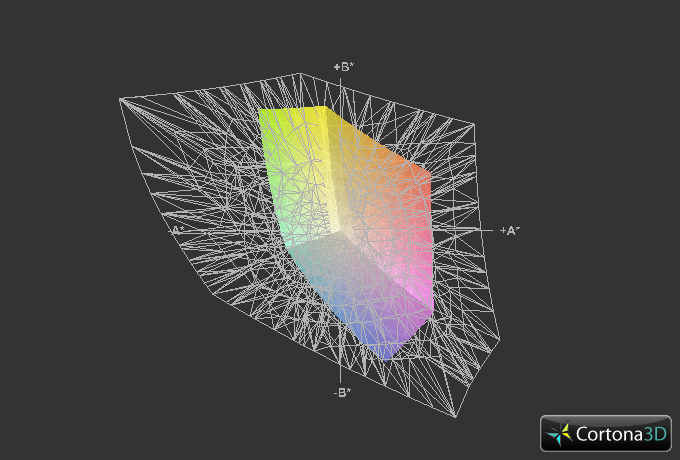 It operates with a native resolution of 1366x768 pixels. Toshiba does not offer other screen models. 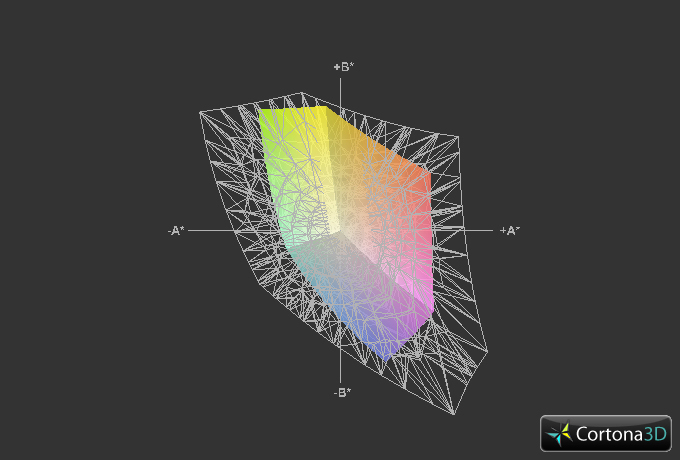 The screen's average brightness of 177.1 cd/m² is everything but good. An 800 Euros (~$1093) laptop cannot afford to deliver such a rate nowadays. The screen of Asus' laptop is even a bit worse with 170.4 cd/m², and the IdeaPad's screen supplies a somewhat better yet not good rate (195.6 cd/m²). The Satellite does not achieve outstanding rates in contrast (289:1) or black value (0.66 cd/m²) either. 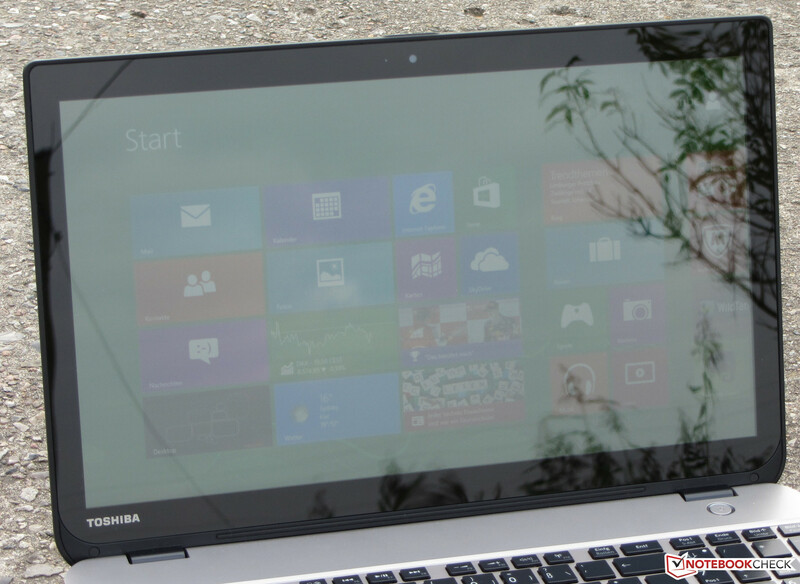 All in all, Toshiba installs a screen that is inferior to many low-priced laptop models. The IdeaPad (426:1; 0.5 cd/m²) offers better rates and the Asus laptop (544:1; 0.34 cd/m²) supplies quite acceptable rates. The Satellite cannot reproduce either the sRGB or AdobeRGB color space. They are important for professional image editing. The Satellite's screen only presents a glimmer of light in the color values. They are quite decent. The average DeltaE 2000 deviation is 5.66. This rate is surpassed by a few dark colors, red hues and the grayscales. Most yellow, green and blue hues achieve the target of DeltaE smaller than 5. The screen exhibits a marginal bluish cast. The Satellite is virtually useless outdoors. The combination of low brightness, low contrast and reflective surface prevent such undertakings. It can at most be used in shady places. A few online shops state that the Satellite is equipped with an IPS screen in their offers. We can definitely exclude that, and nor does Toshiba mention an IPS screen on its website. The viewing angle stability also corresponds to what is known from most budget laptops: The picture distorts quickly when the vertical viewing angle is changed. It looks better horizontally and the content remains legible from the sides. However, the picture dims the larger the angle is. We would have expected more from an 800 Euros (~$1093) laptop. 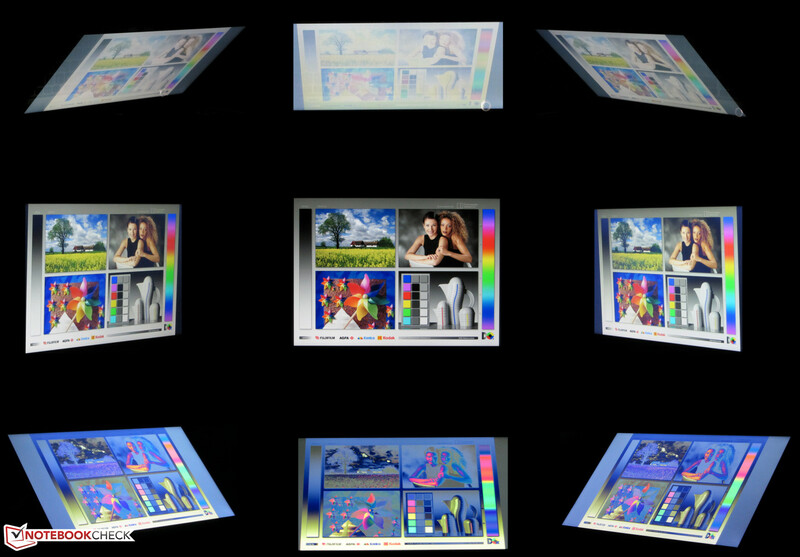 There are TN LED screens with a somewhat better viewing angle stability available. 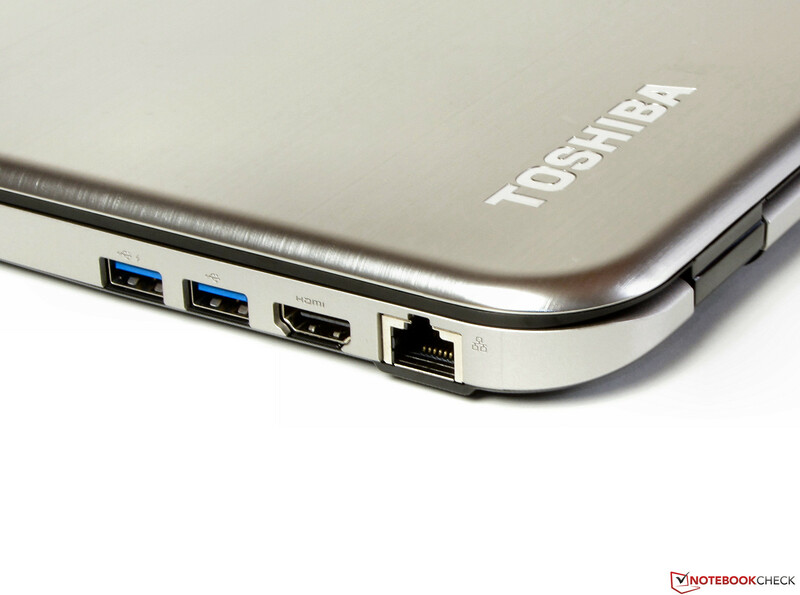 With the Satellite U50t-A-100, Toshiba has an ultrabook in its line that belongs to the office category. The device is designed for routine applications and tasks, for example office work, internet browsing, playing videos. Computer games are not one of the primary application fields. Nevertheless, it is possible to play some games to a limited extent. The Satellite is currently price-tagged at around 800 Euros (~$1093). Other configurations are presently not available. Toshiba installs a Core i5-4200U processor in its Satellite. This Haswell dual-core CPU has a base clock of 1.6 GHz. Its speed can be increased to 2.3 GHz (both cores) and 2.6 GHz (one core) via Turbo. The Core i5 used is a ULV processor; the CPU's power consumption is low owing to a relatively low operating voltage. Intel specifies a TDP of 15 watts for the Core i5. The processor performed the Cinebench single-thread benchmarks with 2.3 GHz. The core was occasionally boosted to 2.6 GHz. The scores of the Satellite and IdeaPad (Core i5-4200U, GeForce GT 730M) are on a par. After all, both laptops sport the same CPU. Asus' laptop (Core i3-3217U, GeForce GT 740M) clearly lags behind both contenders, which is no surprise. 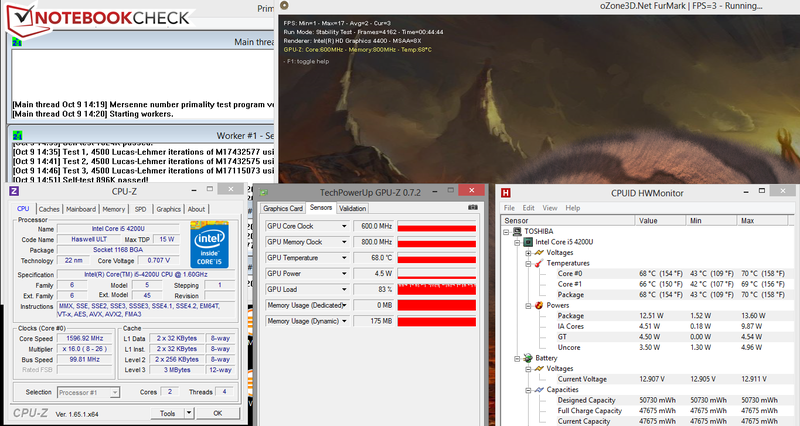 The Core i3 processor in the P56CB clocks with 1.8 GHz and does not feature Turbo and consequently, it processes the Cinebench tests much slower. Furthermore, the processor is based on the Ivy Bridge architecture and would score a bit worse than the Haswell CPUs in the contenders even with the same speed. Both the IdeaPad and the P56CB have the lead in the GL tests since they both sport dedicated GeForce GPUs. The system performance does not give reason for complaint. The system operates swiftly and applications are opened quickly. The laptop greatly benefits from its SSD cache. The very good PCMark scores confirm this subjective impression. 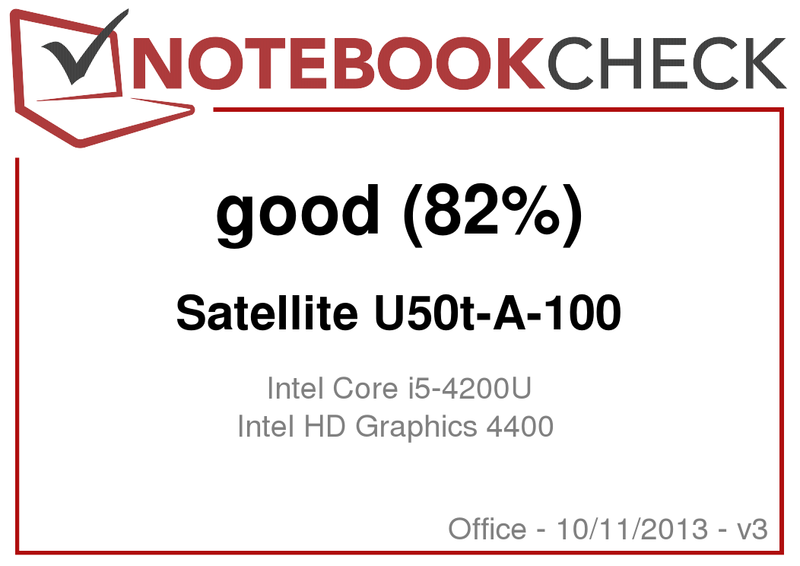 The Satellite scores much better than the Asus laptop (Core i3-3217U, GeForce GT 740M) and even the IdeaPad (Core i5-4200U, GeForce GT 730M) is also marginally defeated. We replaced the hard drive including the SSD cache with a solid state drive (Crucial RealSSD C300 - 64 GB) and reran PCMark 7. The score only increased by 5.6% to 4315 points. However, we presume that the plus would be greater when a more modern and thus faster SSD is used. Apart from the only marginally higher PCMark score, the system started noticeably faster with our SSD. 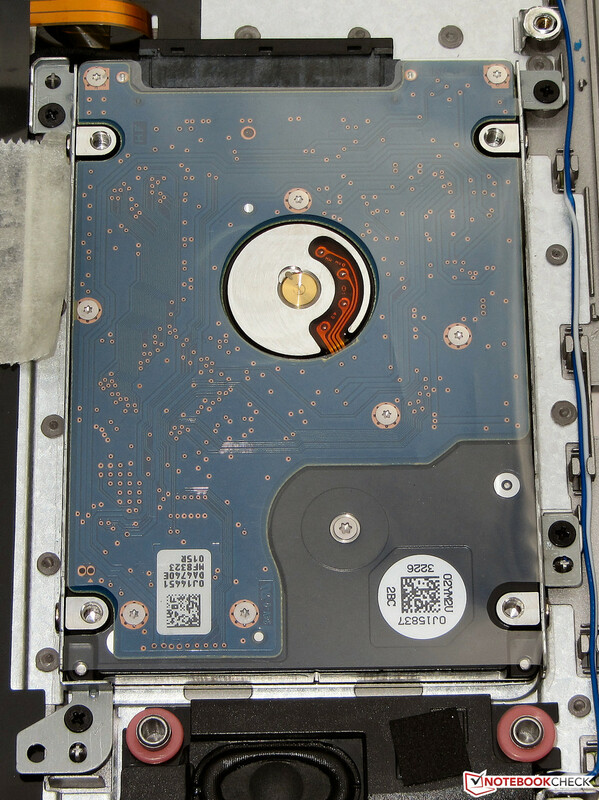 A hard drive from HGST's Travelstar 5K1000 line is used as a storage device. It has a capacity of 750 GB and spins with 5400 revolutions per minute. 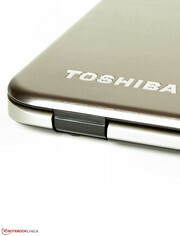 The drive is supported by a 32 GB SSD cache from Toshiba. CrystalDiskMark recorded a sequential read speed of 95.05 MB/s. HD Tune delivered an average transfer rate of 65.8 MB/s. These rates are no longer contemporary for a 5400 rpm drive. However, they are offset. The hard drive has only a short access time of 16.1 ms and the Satellite can also offer speedy 4k read and 4k write speeds owing to the SSD cache. These rates are significant because most data is stored in 4k-sized blocks. 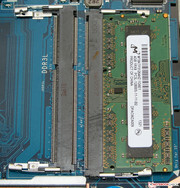 The HD Graphics 4400 core from Intel is used in the Satellite. The GPU supports DirectX 11.1 and clocks with a speed ranging from 350 MHz and 1000 MHz. The Satellite naturally cannot compete with the IdeaPad (Core i5-4200U, GeForce GT 730M) or the Asus laptop (Core i3-3217U, GeForce GT 740M) in any of the 3DMark benchmarks. Both computers sport a powerful GeForce GPU. The laptop's hardware configuration even allows playing various games in low resolutions and quality settings. A few undemanding games will likely run smoothly even in the native resolution and medium quality settings, e.g. Starcraft 2: Heart of the Swarm. The frame rates could be boosted a bit by installing a second working memory module in the Satellite. The working memory could then work in dual-channel mode and the GPU would be maxed out better. The frame rates should increase by 5 to 20% on average, depending on the game. We tried this and the frame rates (min/med/high) clearly increased in the games Tomb Raider (38.1/21.8/13.1), Grid 2 (44.8/22.1/15.8), and F1 2013 (28/22/20). We noticed the biggest improvement in Saints Row (21.9/16.8/7.4). Users who want to play regularly should think about buying another ultrabook. Both the IdeaPad and the P56CB would come into question since they feature a midrange GPU that allows playing many up to date games. The Satellite pleases with an idle noise level ranging from 30.7 and 32.8 dB. 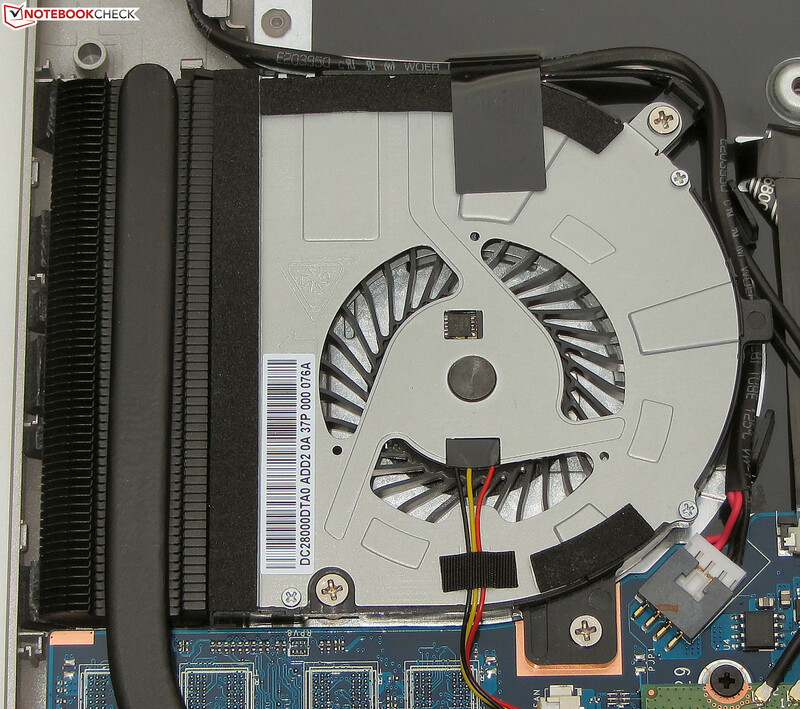 The fan is frequently inactive. The IdeaPad (31.2 to 32.7 dB) and the Asus laptop (30.5 to 32.2 dB) are on a par with the Satellite. The Satellite's noise does not increase much during medium load (via 3DMark06) or full load (via stress test: Prime95 and Furmark) with 33.6 and 35.4 dB. But the full load rate has its price. Neither the CPU nor the GPU ran at full speed in our stress test and the fan spins much slower. That is noticed adversely. As soon as the fan really starts up during load, it produces a very annoying whistling/buzzing noise. The IdeaPad's noise of 34.3 and 36.6 dB are on a par with the Satellite and the Asus laptop's rates of 38.8 and 44.2 dB are considerably higher. The casing temperatures of all three devices are within acceptable limits in idle mode. The Satellite heated up the least and its temperatures only climbed moderately during load. 40 °C was exceeded in the vent's area. The P56CB heated up more than the Toshiba laptop. We ascertained the highest rates on the IdeaPad. A temperature of over 50 °C was reached in one spot (fan). The CPU ran the stress test (Prime95 and Furmark run for at least one hour) with 1.6 GHz in both battery and AC mode. The Turbo was never used. The GPU performed the stress test with 600 MHz in AC and battery mode. It is reasonable to assume that the cooling system cannot cool both components sufficiently when they are fully loaded at the same time. This is not noticed in routine use because our stress test represents an extreme situation that will barely occur in real-life. The performed benchmarks turned out as we expected from the installed hardware. The CPU's temperature settled to approximately 68 °C in AC mode. 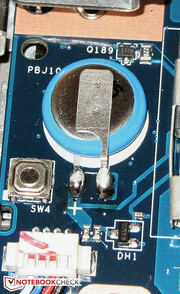 The Satellite's stereo speakers are located on the device's underside. They produce a thin sound that lacks bass. Speech is well-intelligible. A better sound can only be achieved by using headphones or external speakers. We measured an idle power consumption ranging from 5.1 to 8.8 watts. These rates are acceptable for an ultrabook. The IdeaPad (6.7 to 10.6 watts) and the Asus laptop (7.4 to 10.9 watts) consume more power. The consumption climbs to 24 watts during medium load (via 3DMark06) and 26.1 watts in full load (stress test via Prime95 and Furmark). The full load power consumption is insignificantly higher because neither the CPU nor the GPU run at full speed. It is not surprising that the IdeaPad (40.7 and 45.5 watts) and the P56CB (47.5 and 54 watts) have a much higher power consumption since both sport a GeForce graphics chip. The Satellite achieved an idle runtime of 10:09 h. That places it between the P56CB (9:34 h) and IdeaPad (11:43 h). We ascertain the idle runtime using Battery Eater's Reader's test with minimum screen brightness, enabled energy-savings mode and disabled wireless modules. The Satellite shuts down after 2:18 h of load. Both the IdeaPad and Asus are on a par with that. We use Battery Eater's Classic test to determine the load runtime. Here, the screen's brightness is set to maximum, high-performance mode and the wireless modules are enabled. The Satellite lasted for 5:48 h in the Wi-Fi test. 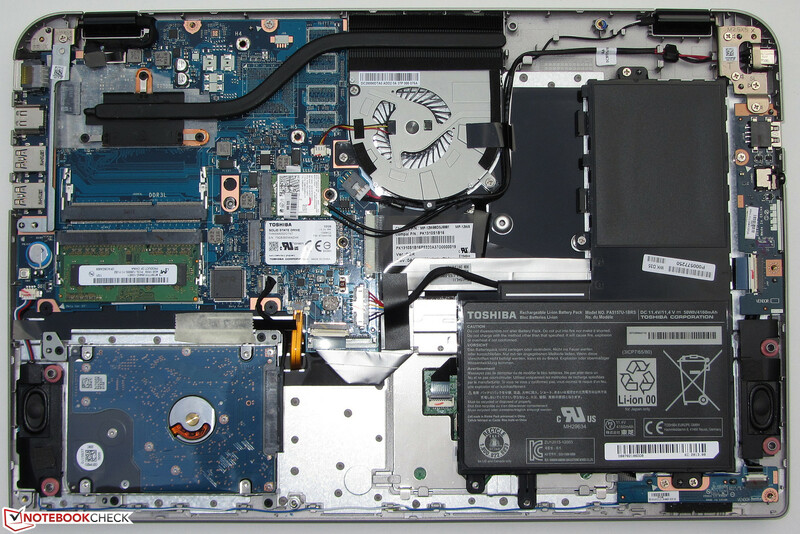 The IdeaPad (5:29 h) and particularly the P56CB (4:27 h) are drained sooner. Websites are automatically opened every 40 seconds in this test. The energy-savings profile is enabled and the screen's brightness is set to approximately 150 cd/m². It is not surprising that the P56CB achieves the shortest runtimes. It is furnished with the lowest battery capacity of all three comparison devices (Toshiba: 50 Wh; Lenovo: 52 Wh; Asus: 44 Wh). 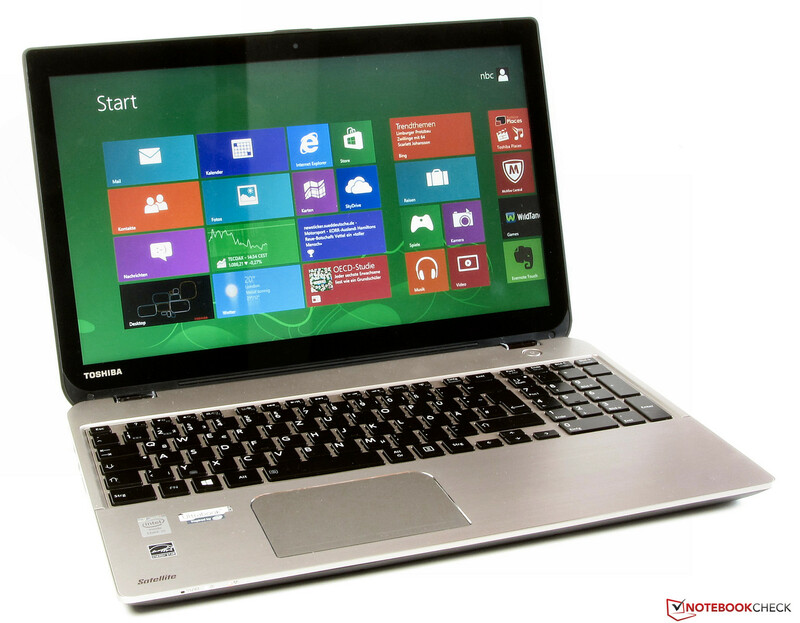 Toshiba's Satellite U50t-A-100 offers a decent application performance and comes with a lot of storage capacity. Furthermore, it usually runs quietly and consumes little power. 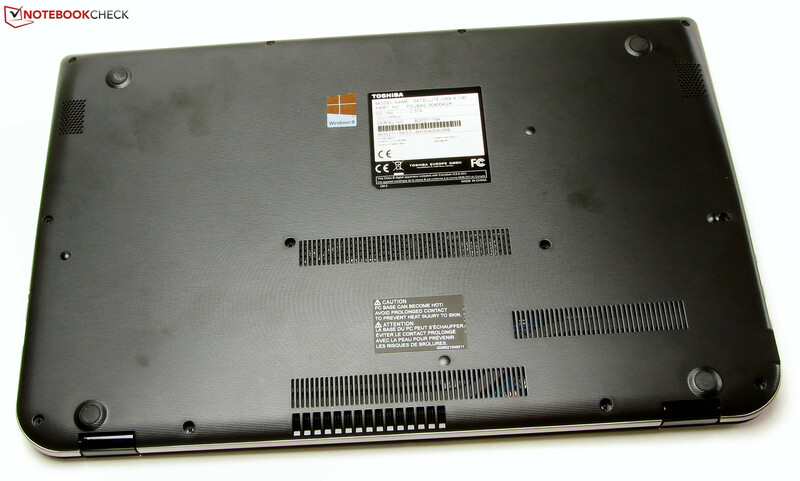 The laptop comes with good input devices and the battery runtimes are also satisfactory. However, Toshiba ruins the good impression with the screen. It is quite dark and low in contrast. This should be better. The fan's whistling/buzzing noise during load is not acceptable either. We would wish for a non-touch version of the U50-A with a good, matte IPS screen from Toshiba. Then Toshiba would truly have a rounded ultrabook in its product line. The AsusPro P56CB-XO193G can be recommended to users who value a matte screen and/or optical drive. It even satisfies gaming intentions. 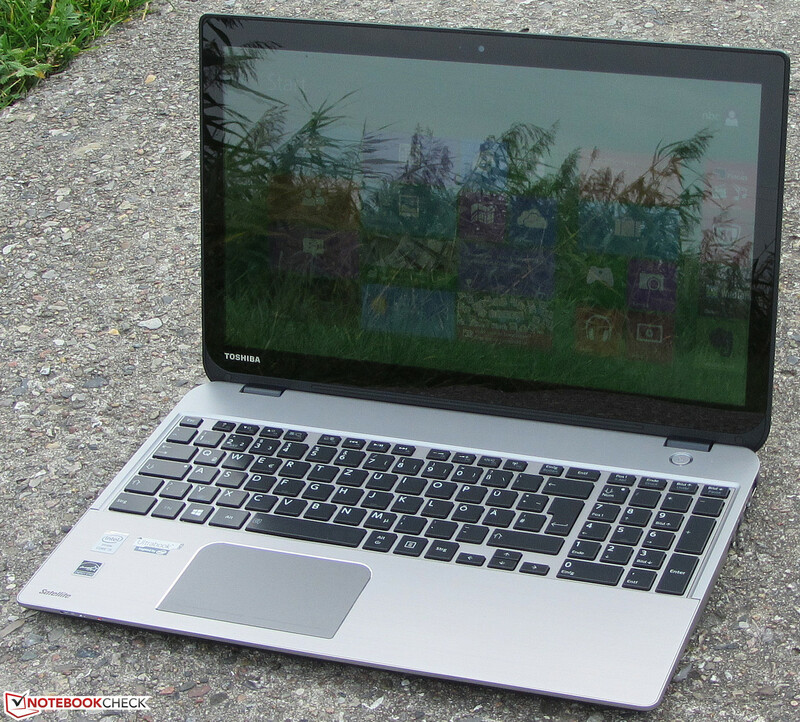 Lenovo's IdeaPad U430 Touch is also gaming-suitable and one outstanding feature of the laptop is its very good casing. ...have a firm hold on the lid. ...is supported by a 32 GB SSD cache. 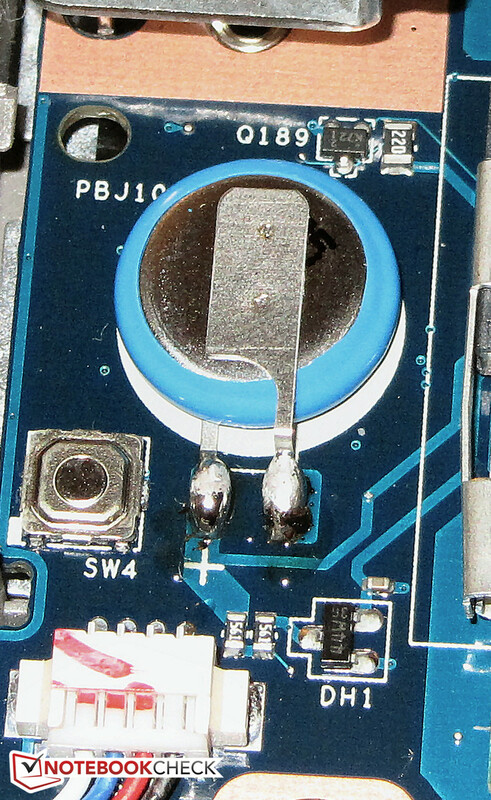 The BIOS battery is soldered. It is possible to replace the battery. It supplies a capacity of 50 Wh. The battery is plugged into the motherboard. ...and provides a nominal capacity of 45 watts. The speakers are located on the underside. The decent application performance and good input devices are pleasing. The same goes for the battery runtimes and low power consumption. No question: a better screen. 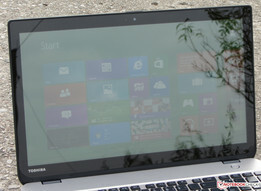 Toshiba installs a screen that is inferior to many displays found in budget laptops. We don't know what got into Toshiba here. Lenovo IdeaPad U430 Touch, AsusPro P56CB-XO193G, Lenovo IdeaPad S500 Touch 59372927, Asus VivoBook S551LB-CJ026H, Asus VivoBook S500CA-CJ005H, HP Pavilion Sleekbook TouchSmart 15-b153sg, HP Pavilion Sleekbook 15-b004sg, Acer Aspire TimelineU M3-581PTG, Dell Inspiron 15z (5523).